Recently I re-discovered a stretch of the South Australian coast which I hadn’t visited for years. I cannot imagine why I had left it so long to return. Driving from Adelaide along the Princes Highway, instead of continuing on to the Flinders Ranges as most of our fellow road users appeared to be doing, we turned left at Port Wakefield and explored the Yorke Peninsula which separates Spencer Gulf from the Gulf of St. Vincent. Consisting of Mallee scrub and flat farming land, this area is largely undeveloped as far as tourism goes, but that is its charm. Veering off the main road will take you to friendly little country towns and numerous tranquil coves, all sporting caravan parks and other quiet, seaside lodgings. The towns are only about half an hour away from each other so the whole region can really be explored in a couple of days. We elected to stay at Port Vincent Caravan Park and our site was on the grassy verge just above the beach. Innes National Park is at the toe of the peninsula and is home to some 90 species of birds, the ruins of the historic Inneston village and 9,200 hectares of beautiful vegetation. If you access this area via the scenic route you will thrill to the rugged, sculptured coastline. However, this involves traversing a mainly gravelled and often corrugated road. Walking trails, heritage accommodation and the occasional sighting of dolphins and southern right whales are the stuff of the Yorke Peninsula – just the spot for rest and relaxation. We then travelled around the verdant Fleurieu Peninsula, delighting in the attractive beaches which fringe its rolling hills, olive and wine growing areas and dairy farms. The pleasant little town of Normanville, where the Bungala River meets the sea, is a good base for the western side of the peninsula. From there you can make short excursions to Rapid Bay, where Colonel Light first landed and established the colony of South Australia, and Second Valley, which boasts dramatic cliffs, a good fishing jetty and a great spot for scuba diving. The whole area is dotted with limestone and sandstone ruins and of course wineries; visit the more intimate family vineyards and learn a personal history of the district. A half-hour drive away is Cape Jervis, the stepping off point for Kangaroo Island. Either travel acrosst to the eastern side of the Fleurieu Peninsula, via the lush Inman Valley, or follow the coast to Victor Harbour and historic Port Elliott. Granite Island, linked by a bridge from Victor Harbour, is home to 2,000 little penguins (Eudyptula minor). There are many tourist attractions on this part of the peninsula, including various walking trails, the best known of which is the Hans Heyson walk. A few kilometres along the coast is Port Elliott, on beautiful Horseshoe Bay. Away from the bulk of the tourists, its charming buildings house antique, coffee and book shops. Goolwa and Hindmarsh Island are the next ‘must see’ spots; gateway to the Coorong, Goolwa is the only registered inland port in Australia. In the nineteenth century produce was shipped up the river system as far as Queensland. Traditional boat-building methods can be seen on the re-developed wharf and the biennial Wooden Boat Festival is hosted here. Eco-cruises into the Coorong National Park leave from the wharf. The town itself has charming heritage buildings, pleasant eateries, and lovely old homes can be seen behind high hedges. Hindmarsh Island, connected by bridge from Goolwa, is the point at which the Murray River enters the Southern Ocean. The area is part of the Coorong National Park and is internationally renowned for its aquatic bird habitats. Because of their intimate knowledge of and affinity with this river-bound island, Aboriginal rangers can give you an interesting history of Hindmarsh and nearby Lakes Albert and Alexandrina. The Coorong, one of Australia’s richest wetland areas, is home to the Ngarrindjeri people, who have long lived in harmony with this stark, fantastic area and its diversity of natural elements. Its name derives from the Aboriginal word ‘karangh’, meaning narrow neck. Covering 47,000 hectares and no wider than 4 kilometres, the Coorong is protected from the sea by 145 kilometres of sand dunes along the Younghusband Peninsula. Nature-lovers will find plenty of Australian wildlife, as over 230 species of migratory birds frequent the area. There are many camping spots and small caravan parks giving naturalists and fishermen access to the two lagoons and the beach beyond. We stayed at Policemen’s Point and, rising at dawn, you could wade through the lagoon, marvelling at the rock formations and collecting shells whilst watching the sun rise. The point was so called because it used to be a stopover for police escorting gold en route to Adelaide from the Victorian goldfields. Over the years, the River Murray, called the Moorundie or Murundi by the Ngarrindjeri, has struggled to meet the sea because of too much interference at the hands of man. However, moves are currently afoot in an attempt to redress the assault so that this wonderful waterway can continue its meandering. It flows through a variegated geographic terrain, from limestone cliffs, huge stands of river red gums, billabongs and flood plains. Our next stop was Robe. This is where 16,500 Chinese came ashore in the mid 1800s, to avoid paying a Victorian land tax. From here they trekked to the goldfields. The Custom’s House, the old gaol and the shipping marker at Cape Dombey all speak of the area’s colourful history. The coastline here is wild and windswept – take the walk along the clifftops to where the sea runs into Lake Fellmongery. You time your crossing of the footbridge as the sea crashes in – exhilarating! Robe has quaint white-washed buildings, good restaurants and interesting little back streets. There is altogether a holiday atmosphere in this town, with a small picture theatre, bookshops and little galleries. Drive just a few kilometres from town and you are in the midst of rustic old farm buildings and, of course, wineries. 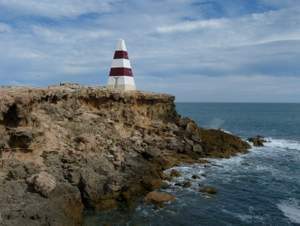 I have only mentioned just a few attractions and towns of this part of the South Australian coast but of course there are many more. Often the quiet little places leave the most enduring memories. Instead of going north, plan now to make your next holiday in the area where six thousand years of Aboriginal habitation and nature’s kaleidoscope have left their imprint.